Autumn-flowering shrubs give colour to the garden just as we think summer is on the wane and winter is knocking at the door, providing a glorious flush of blooms until the first frosts occur. Autumn is so much more than just a show of sunset shades from the foliage of deciduous shrubs and trees. There are many autumn-flowering shrubs that bring out their best display of blooms as summer passes into winter. In addition, some summer-flowering plants, such as roses, can also be encouraged to flower in autumn if they are cut back lightly and fertilised after their summer flowering. Remember too, that autumn is the best time to plant shrubs as the weather is mild and the plants become established more easily. Because the soil is still warm and moist, good growth is made before winter, adequate root systems are formed and the plants are well set to withstand the vagaries of winter weather and demands of spring growth. Shrubs, like any plants, will do best if planted in the right spot in the garden. Sun-loving shrubs will not thrive in dark, shady corners and will consequently not flower well. Make sure you water the shrub well after planting and fertilise with a balanced fertiliser every few months. Provide a mulch around the plant to help conserve moisture. After your autumn-flowering shrubs have finished their floral displays, it is a good idea to trim them back to encourage healthy growth. Ribbon bush (Hypoestes aristata), an indigenous evergreen beauty with clouds of lilac, purple or white flowers. It is a tough plant which tolerates much neglect. Ideal for the middle of the border, the ribbon bush grows to about 1,5m and can compete with tree roots. It is frost tolerant and water wise. It will grow in the sun or shade. Lion’s ear (Leonotis leonurus) is an indigenous shrub which bears whorls of showy orange or cream flowers on the top third of its 2m tall, upright stems. It is frost resistant and tolerant of dry conditions. Plant in full sun at the back of the border. Established plants need to be pruned hard after flowering. The nectar in the blooms is relished by sunbirds. The sasanqua camellia is the first of the camellia family to flower, providing a show of frilled flowers in white, pink and red against the backdrop of its glossy, dark-green foliage. Its evergreen, graceful growth habit makes it suitable for screening or as an accent plant. It grows up to 3m high and likes a position in semi-shade. Camellia sasanqua and its cultivars grow well in a container. 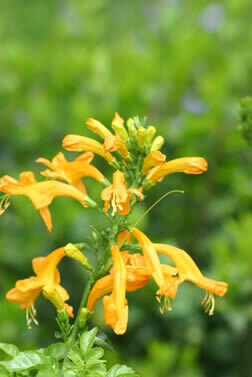 Cape honeysuckle (Tecoma capensis) is a summer-flowering shrub that will continue to bear its orange blooms throughout autumn until the cold winter weather sets in. It reaches about 3m high with a spread of about 2m. The yellow, red, apricot, and rose cultivars are somewhat smaller. 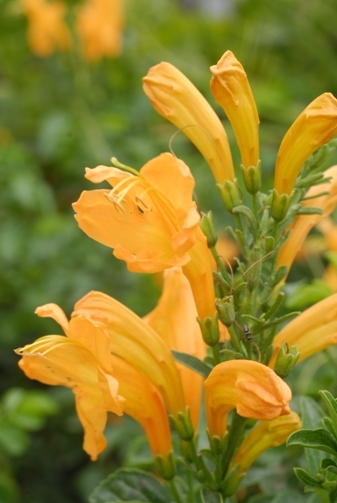 This indigenous shrub prefers a sunny spot but will grow in semi-shade where it will flower less profusely. In frost-free areas it is evergreen. Indigenous Plectranthus species offer blooms in various shades of purple, pink and white, and are great for shady spots in the garden. 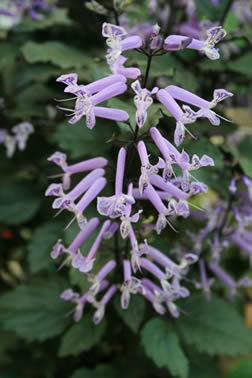 Plectranthus ‘Mona Lavender’ is a small shrub up to 60cm high with masses of mauve blooms. Its new foliage, as well as the reverse of its leaves, is purple. Plectranthus ecklonii is a spreading shrub up to 1,3m high which bears masses of purple flower spikes. It will tolerate more sun than most plectranthus, especially at the coast. 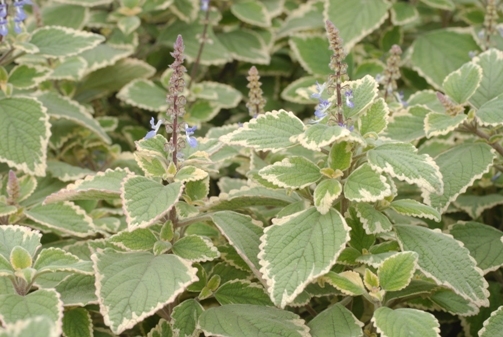 However, no Plectranthus species will tolerate frost, so in cold gardens grow them in a frost-free spot under trees or on the patio. 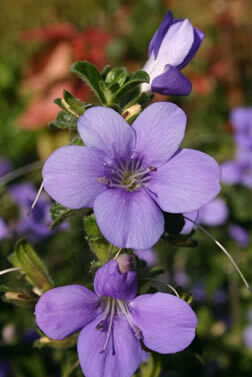 Bush violet (Barleria obtusa) is a water wise indigenous shrub which provides a riot of colour in autumn. It bears masses of rose or pale blue trumpets on bushes up to 1m high. It is easy to grow, provided it does not get harsh frost. Plant in well-drained soil. The misty plume bush (Tetradenia riparia) bears feathery flowers in shades of pinky-white. This indigenous shrub only grows in frost-free regions and needs to be pruned back hard after flowering. It grows up to 3m high and is deciduous. Make the planting hole at least 50cm x 50cm x 50cm – and larger if you are planting a larger shrub. Put 1 tablespoon of bonemeal in the planting hole to help establish the roots, and 1 cup of a balanced fertiliser. Add one-third of a bag of compost and the topsoil from the hole, and mix in with the fertilisers. Then add a water retaining polymer according to the instructions on the packet. Remove the plant from its bag by cutting the bag, open out the roots a bit, and plant in the hole with the top of the soil at the same level as it is in the planting bag. Firm the soil around the plant and water thoroughly. Use the leftover subsoil to make a rim of soil around the hole to retain water. Apply a mulch to help retain moisture in the soil. Water regularly to keep the soil around the plant moist until new growth appears. Then water less frequently but always deeply to encourage deep root growth.